In 1857, the centennial of the British East India Company’s mastery of the India, the subcontinent’s sepoy troops rebelled against the Company Raj. There had been rumblings of disaffection for months before, signals that read portentous in retrospect but passed by the oblivious occupation army. That March, aggrieved at having been issued new ammunition cartridges rumored to have been prepared with pig and cow fat in offense to both Muslim and Hindu soldiery,* Mangal Pandey wrote himself into India’s nationalist lore by mutinying at Barrackpore. 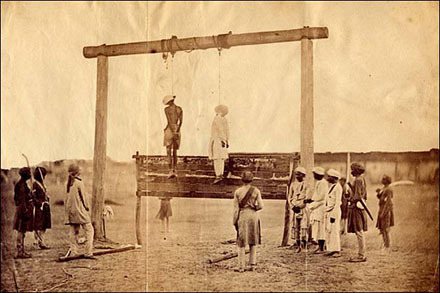 Pandey’s own revolt fizzled, and saw him hanged. But he’s remembered as the precursor of the much wider rebellion that ensued. 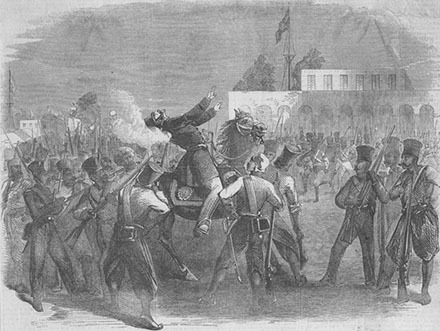 On Sunday, May 10th — the British garrison’s guard was down for religious services — sepoys at Meerut mutinied, too. Just the day before they had seen 85 of their own brothers in arms provocatively marched in chains after refusing the controversial cartridges. Now, they fell upon their commanding officers, and on their families and British civilians in an wave of pent fury. Brits misforunate enough to be caught in it spent the dark hours that night as prey. Meerut is just 60 kilometers or so from Delhi, and the mutineers soon made for that city — where the last Mughal Emperor, 81-year-old Bahadur Shah II, known as Zafar, “reigned” as Prince of Delhi. In reality, he was a pensioned ward of the East India Company … but symbolically, he was the heir to a once-mighty empire. The rebels fell on Delhi, slaughtering Englishmen and women who had not been quick enough to escape the city, and looting opportunistically. Zafar tsk-tsked the disorder but he and most of his princes joined the revolt. Why not? The Company had already made known that the imperial title would disappear with Zafar’s death; here was the one last chance to restore the Mughal dignity. This ride on the tiger would prove instead to be the final destruction of Zafar’s house. On May the 16th, the sepoys, who were far from deferential to the emperor they proposed to raise up, demanded 52 European prisoners that Zafar’s courtiers were holding — holding instead of murdering, a restraint the sepoys angrily suspected was calculated as a potential future sop to the returning British. By putting those prisoners all to sudden death, they relieved the emperor of any avenue for compromise, binding him inescapably to the insurrection. The sepoys then called for the prisoners, who were being kept and fed by Zafar in a room beside the Palace kitchens, not far from the Lahore Gate. They bound them and took them to a peepul tree near the shallow tank in front of the Palace drum house, the Naqqar Khana, and began to taunt them that they were about to be slaughtered. It was anyway too late. By the time Ahsanullah had finished speaking, the sepoys and the Palace mob had got to work. They made the prisoners sit down, and one of them fired his carbine at them. After this two of the King’s personal armed retainers killed all the Europeans, men, women and children, with their swords. There were about 200 Mussalmans standing at the tank, uttering the coarsest abuse at the prisoners. The sword of one of the king’s retainers broke. After the slaughter, the bodies were taken on two carts, and thrown into the river. This occurrence caused a great excitement amongst the Hindus throughout the city, who said that these Purbeas who had committed this heinous and atrocious cruelty could never be victorious against the English. Everywhere the British convinced themselves that the atrocities committed by the sepoys against their women and children absolved them of any need to treat the rebels as human beings: “Since they had butchered our defenceless women and children,” wrote Colonel A. R. D. Mackenzie, “we would have been more than human, we would have been less than men, if we had not exterminated them as men kill snakes wherever they meet them.” It soon became exceptional among the British to regard anyone on the opposite side of the battle lines as even belonging to the same species: “I [simply] cannot consider these sepoys human beings,” wrote Captain J. M. Wade, “and it is only common practice to destroy them as reptiles.” George Wagentrieber helped fan such flames from his new Delhi Gazette Extra printing press in Lahore: “Our army is exasperated almost to madness by what they have seen of the brutality of the insurgents,” he expostulated in one editorial. a battle of principles, a conflict between truth and error; and that because they had elected in favour of darkness, and eschewed the light, therefore they could not possibly succeed. Moreover, they had imbrued their hands in the innocent blood of helpless women and children, and that very blood was [now] appealing to heaven for vengeance. The appeal was unquestionably heard. The Lord could not do otherwise than be avenged on such a nation as this. 1857 marks the textbook end date for the Mughal Empire. Many of Zafar’s sons and grandsons were killed (at least 29 by execution, according to Dalrymple) as the revolt was crushed. This photo of an unidentified hanging of India rebels comes from this page, which also features a number of images of Delhi after its capture from photographer Felice Beato. Beato’s work in China has been highlighted elsewhere in Executed Today’s annals.